Collagen is a complex structural protein that maintains strength and flexibility throughout the body. Super Collagen is made up of the collagen peptides Type 1 & 3 which support collagen in skin, hair nails, muscles, tendons, ligaments and bones. Super Collagen is enzymatically hydrolyzed, providing amino acid ratio with a low molecular weight for maximum bioavailability and utilization by the body. When Super Collagen is taken internally, the body receives the raw materials it needs to supplement the collagen found in all of the areas and may act as a messenger to trigger the synthesis of new collagen fibers. 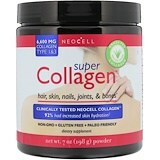 Super Collagen is neutral in taste and is specially formulated in an easy to take powder form. It works synergistically with Vitamin C and is recommended to be mixed with orange juice or a Vitamin C supplement. Super Collagen Type 1 & 3 derived from pharmaceutical food grade bovine collagen. Does Not Contain: Soy, wheat, lactose, starch, corn, yeast, or artificial flavors. Gluten free.